This picture shows shops at the junction of Potter Street and Priorswell Road. It was taken when the road had just been realigned. Previously the road (Abbey Street) ran through the arch of the Priory Gatehouse. This page was added by Inspire Librarian on 26/11/2010. I was brought up in this area in the late 50's. I don't remember the road ever going through the archway (though I can remember when there were no gates and pedestrians could walk through the gatehouse arch). I wonder when precisely the road was realigned? 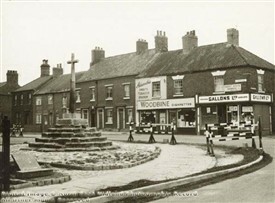 The road which ran under the gatehouse was realigned in 1894 and the cross moved to it's present position in 1896.